MASS.commuting was produced in partnership with the UMass Donahue Institute and generously sponsored by MassHousing. Our analysis of U.S. Census data reveals that the morning and evening commutes are rapidly worsening compared to the rest of the nation, a situation that erodes our qualify of life and economic health. Massachusetts commutes are getting worse faster than almost anywhere else in the nation. In fact, over the last 20 years, our commute rates increased at the sixth fastest rate. But when matched up against the 10 states with the longest commutes, the Bay State is second only to Georgia in how quickly our commutes are lengthening. Nearly one in five workers—551,000 people—endure a roundtrip commute of at least an hour and a half. This number, roughly the population of the City of Boston, has nearly doubled since 1980. The average commuter in Massachusetts spends 27 minutes traveling each way. That adds up to the equivalent of 25 work days (8-hours) consumed each year by commuting. What would you do with an extra 25 days? Many reasons account for lengthening commutes, such as more cars on the road than ever before, the growing distance between work and home, and static road capacity. The reasons for the long commutes vary from region to region. For example, congestion seems to be the cause for long commutes in the MetroWest area, while the distances traveled to work appear to account for travel time in the Berkshire hill towns. The daily commuter suffering surely impacts our quality of life and economic health. 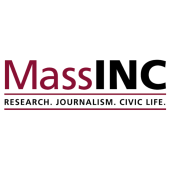 In MassINC’s recent Quality of Life poll, Bay State residents cited “roads and traffic situation” as second only to the cost of housing as a top concern about living in Massachusetts. More time spent commuting is less free time for other pursuits—family time, civic participation and leisure activities. An eroding quality of life, with high home values and long commutes, may impact our ability to attract and retain a skilled workforce. The solutions to the worsening commutes are likely to be as varied and as complex as the causes. Building more roads and expanding public transit are not silver bullets. Policy makers must also consider how to attract job growth outside Route 128 and address the rising cost of housing. The business community can assist by offering staggered work hours and more options to work at home. The only alternative is more time spent commuting, which for most people means time alone behind the wheel of a car. That might be good for radio stations, but is it time well spent? It is our hope that MASS.commuting will contribute to a statewide discussion about how Massachusetts can slow the increase, or even reduce commute times.